The West Coast (Māori: Te Tai Poutini) is a region of New Zealand on the west coast of the South Island, one of the more remote and most sparsely populated areas of the country. It is administered by the West Coast Regional Council. At the territorial authority level, the region comprises Buller District, Grey District and Westland District. 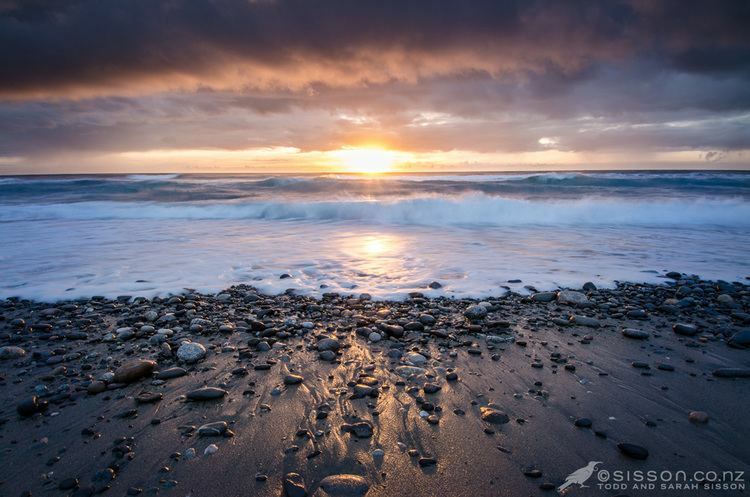 The principal towns are Westport, Greymouth, and Hokitika. The land is very scenic, with wild coastlines, mountains and a very high proportion of native bush, much of it native temperate rain forest. It is the only part of New Zealand where significant tracts of lowland forest remain: elsewhere, for instance on the Canterbury Plains and in the Firth of Thames, they have been almost completely destroyed for settlement and agriculture. 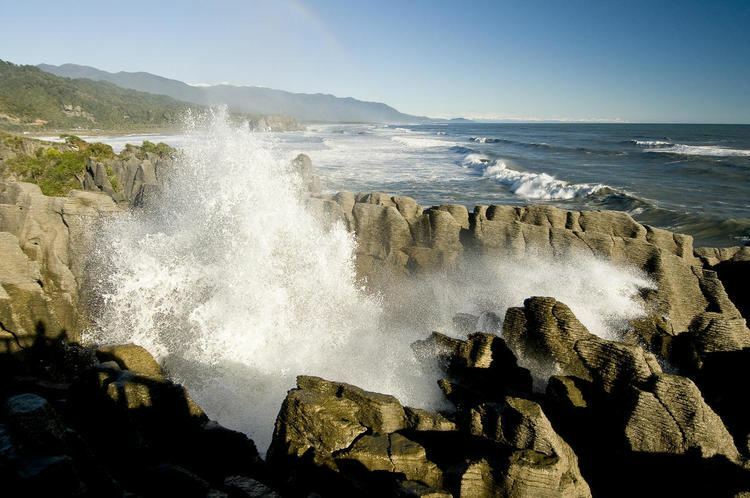 Scenic areas include the Haast Pass, Fox and Franz Josef Glaciers, Jordale Rocks, the Pancake Rocks at Punakaiki and the Heaphy Track. The region has a very high rainfall due to the prevailing northwesterly wind pattern and the location of the Southern Alps, which give rise to heavy orographic precipitation. The rain shadow effect is responsible for the relatively arid climate of the Canterbury Plains on the other side of the Southern Alps. The region's area is 23,276 km2. It is divided into the three districts of Buller, Grey and Westland. Industries on the West Coast include mining for coal and alluvial gold, forestry and wood processing, and also fishing (including whitebaiting), tourism and farming. Dairy farming has grown strongly - the local dairy co-operatives Westland Milk Products remained independent when most others merged to form Fonterra in 2001. Other industries are the manufacturing and sales of greenstone jewellery, sphagnum moss gathering and stone-collection for garden landscaping. The sub-national GDP of the region was estimated at US$779 million in 2003, 1% of national GDP. The region is home to Māori, who valued it for the greenstone (pounamu) found there in abundance. The region was only occasionally visited by Europeans until the discovery of gold near the Taramakau River in 1864 by two Māori, Ihaia Tainui and Haimona Taukau. By the end of the year there were an estimated 1800 prospectors, many of them around the Hokitika area, which in 1866 was briefly the most populous settlement in New Zealand. Following greenstone and gold, the next valuable mineral was coal. Discovered near the Buller River in the mid-1840s, mining began in earnest during the 1860s. By the 1880s coal had become the region’s main industry, with mines throughout the northern half of the region, especially around Westport. Many of these continued in operation until the mid-20th century, and several survive. The region is sparsely populated, especially in the south, with the 2006 census recording 31,326 inhabitants, up from 30,303 in 2001, lower than the 1996 figure. The June 2016d population is 32,600. Industries include mining for coal and alluvial gold, forestry and wood processing, fishing (including whitebaiting), tourism and farming. Dairy farming has grown strongly – the local dairy co-operative Westland Milk Products remained independent when most others merged to form Fonterra in 2001. Other industries are the manufacturing and sales of greenstone jewellery, sphagnum moss gathering and stone-collection for garden landscaping. Monteith's brewery is in Greymouth. The region had one of the strongest growing regional economies of New Zealand in 2007, though from a rather small base. The region has been included in the "Top 10 Coastal Drives of the World" by Lonely Planet. The region has the only New Zealand nesting place of the kotuku (white heron), near Okarito Lagoon, visited by tours from the small farming township of Whataroa. This rare bird appears on the $2 coin.